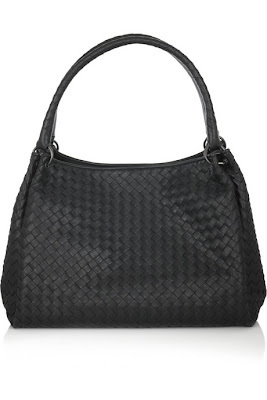 When I think of Bottega Veneta, the first thing I think of is their gorgeous woven bags. 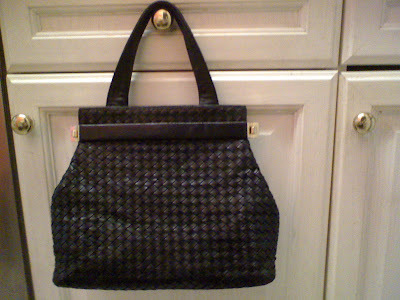 I've always coveted a quality hand-woven bag, but Bottega Veneta is unfortunately well out of my price range. Current Bottega handbags typically boast clean lines, the softest Intreciatto woven leathers, and a classic palette-Wikipedias description, which I heartily agree with, LOL! So I was extremely pleased to pick up a gorgeous bag by Cosci, which is also handcrafted in Italy-their woven nappa bags retail between 500-750 euros. The bag below is the New Intrecciato medium bag, which is available at Net-A-Porter for £1315. My bag is a mix of casual and smart-it has a slouch factor, but the fastening across the top gives an understated formal air to it. This was from the Haven House charity shop yesterday for only £3-I snapped it up!! So, although I didn't need another handbag, I could not pass this lovely bag up and for a change I've started using it straightaway!! Just fabulous!! Love, love it. I saw the heading of the post and thought "No No" oh god she has done it again!, lady how do you do it? I've always wanted a BV too! You have such a sharp eye! I Luv, luv, luv your BAG! I don't know how you do it but you DO IT FABULOUSLY! Fab bag Sharon! Great find! You are the best op shop shopper in the world!! Wait... are you telling me you picked up a bag worth several hundred EUR for 3 quid??? Lady, you are amazing! And I love the woven bag style... there's nothing more timeless and classic. I also love the fact that this look is chic and understated. Have fun taking her out! Another gorgeous find, darling! Bravo! Okay now I'm cross at your brilliance! I'm so jealous - this is a perfect buy. I'm of the coverting Boggata Veneta gang too and your find is amazing!! The same look and flavor as the high price pieces! I want too! LOL! Thank you all so much for your wonderful comments, they are so much appreciated!! How can you do that? You must have an extra sense for bargains!!! Ciao. A.
I love a good handbag..even when I don't need one. Thanks for your note. I've been thinking on this for a long time. I hope it'll be a good story. I wanted to do something a bit different. Naturally, I have some readers, hoping Ellie is pregnant..of all thing..hmmm. Of course, somebody else might be. Not me. I am always, always amazed at your finds. Seriously, if I ever save up enough money to make it over to London I will ask you to take me to all of your regular thrifts! Great score. And it transcends seasons! The shape is so cute! You know, I would love LOVE to have a good rummage through your wardrobe. It's a good job you just have boys! Great bag. I love the shape. I saw a bag with the woven etail at Payless and though they were pretty. Would you like to do a post on how to find good trift deals? thanks for the note..well, hopefully, it won't be too bad...with ellie & lon. Hi everyone-thanks for all your lovely comments-to Nurmisur, I have done posts on thrifting, check out my 'thrifting vintage and style' posts under 'link to my love of'! !